The summer of 2016 has shown that the effects of climate change are not distant fears, but current realities. However, instead of changing course, those in power are stepping up efforts to exacerbate the climate chaos. But from the no new lease on the gulf movement to the Camp of the Sacred Stones, people are resisting these threats to our survival. The historic flooding in Louisiana is being called the worst disaster since Hurricane Sandy hit New York. Tens of thousands of homes have been affected and over a hundred thousand people have applied for disaster assistance. 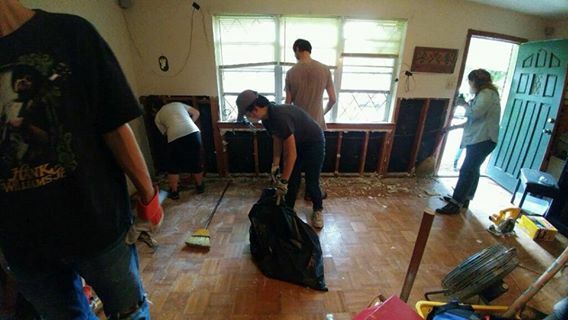 Over the weekend in Baton Rouge, 40 of our volunteers engaged in gutting five homes affected by historic and deadly floods. We were able to assist homeowners in gutting several more homes today. More cars of volunteers are en route. If you are able to volunteer in Louisiana, fill out this google form or just shoot us a reply email. A Mutual Aid Disaster Relief benefit show is also being organized on the ground in New Orleans and folks wanting to act in support and solidarity with affected community residents are adding up quickly! As the floodwaters recede and people are able to return to their homes, a steady supply of materials and volunteers are needed to assist in the long road to recovery and rebuilding. Thank you to everybody who has responded and is currently responding! We couldn’t have done any of this without your support! If you are unable to come volunteer, but still want to help out, you can purchase protective gear for volunteers that are on the ground by visiting our Amazon wish list. As we respond to these and other disasters, we want to do our best to ensure that there is a just recovery and historically marginalized and neglected communities are receiving the support they need to rebuild. How can people experiencing homelessness be integrated into a just recovery? The fact that people are shelter-less due to the disaster of floods or to the disaster of neoliberal economics, doesn’t take away their need for safe and affordable housing. What about Alton Sterling (may he rest in peace and power, and our communities continue to say his name and struggle in memory of him) and people like him who in addition to the floodwaters are forced to also rise above the crushing weight of police violence and the institutional racism of an incarceration state? As we come together to address another community’s self-determined needs post-flood, let’s keep our vision for fundamental change crystal clear as we work rebuilding a better world brick by brick, mucked home by mucked home.